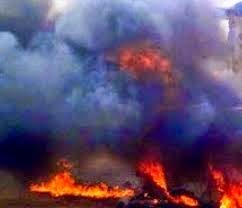 Nigeria-A female suicide bomber blew herself up, killing 10 people at the Federal collage of Education in Kontagora,Niger State today November, 12,2014.
and the female hostels. Among the bodies were two dismembered women who we believe were the bombers.” From the statement one would want to believe that the bombing was carried out by two females. She went on to say,”At least 10 students were killed and several others injured.” The inured are said to have been take to the General hospital and all schools were closed on order from the authorities. This came after another suicide bomber who killed at least 58 students and injured 117 at Potiskum in Yobe a few days ago. President Jonathan declared his intentions to run for the forth coming presidential elections yesterday, will it be a sabotage? We pray for peace in Nigeria. Previous articleSharon Macheso’s husband fined $200.00. Next articleZimbabwe- ZanuPf Youth chairperson abducted.